I have been busy GETTING STUFF DONE today. . . or at least making lists of stuff I need to do. I even taped on a second page to my to do list. There are fewer Xs on there than I would like, but I totally got some stuff accomplished (grocery shopping is important, yo.) Now for what I'll do with those groceries. 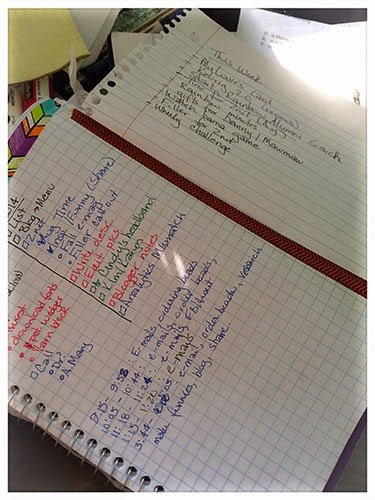 Of course, I'm linking up with Menu Plan Monday at I'm an Organizing Junkie. Pork chops with creamy mushrooms and dill: Let me admit that I've made these many times before. It's one of my favorite ways to make pork chops. I do have to cook the chops longer than suggested in the recipe, but otherwise it's great. I'm sure I'll be making it again, and again, and again! Roasted cauliflower white cheddar soup: This soup was so, so good. Instead of transferring some of the soup to a blender, I used an immersion blender for ease. If my microwave wasn't broken, I think the leftovers would have been eaten. I'll make this again for sure. Dinner's in the oven and there's still plenty left to do on that list. Though admittedly, I'll probably just watch Saturday's Alabama game (I was out of town). . .that's totally on my list though! What yumminess are you planning on having this week? I've challenged myself to get stuff done this week too - the biggest accomplishment was getting out some long overdue thank yous (and grocery shopping too) - you go girl! I'm hoping to make the pork chop recipe tomorrow night. It sounds yummy but our little grocery hardly ever has fresh dill.